The Paper Players Challenge #134. I went out of the box on this one. I created my own background from a piece of scrap dsp. I saw this technique on Pinterest. I found it HERE. Basically, what you need is a patterned paper and an embossing folder, some Versa Mark and some clear embossing powder, a dauber and some black re-inker. Run your dsp through your Big Shot machine in the embossing folder. Then lightly drag your Versa Mark over the raised areas. 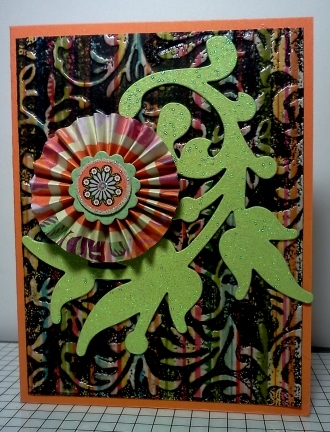 Sprinkle with embossing powder, dust away any embossing powder that falls into the valleys. Then heat. Repeat this process about 3 or 4 times. Then with a dauber and some black ink daub the black ink into the valleys, until they are completely covered. Then take a paper towel and rub ink off any ink that may have gotten onto the raised areas. It's a resist process and I am now "in love" with it! So anyhoo, this is my entry for this week's episode of The Paper Players Challenge. Way to think outside the box, Betty! What a lovely technique for the background and your rosette is beautiful! Thank you for joining us at The Paper Players! Wow, what a great technique. Thanks for sharing the how to. The rosette was the perfect partner. Thanks so much for playing along with us at The Paper Players this week, Betty!